I thought that you maybe interested in www.thefirstpost.co.uk. 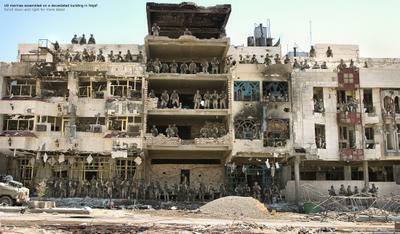 We have a great photo of Charlie Company, 1st battalion, 4th marine regiment. We are wandering of anyone can identify any people in the photo. If you know anyone that could help, please forward them the details. Here is the picture and the caption that appears on that web site. My disclaimer: I don't know anything about these people, so if anyone out there wants to cooperate they should look into it themselves. US marines pose for a group portrait after brokering a peace agreement with Shi'ite militants in Najaf, Iraq. 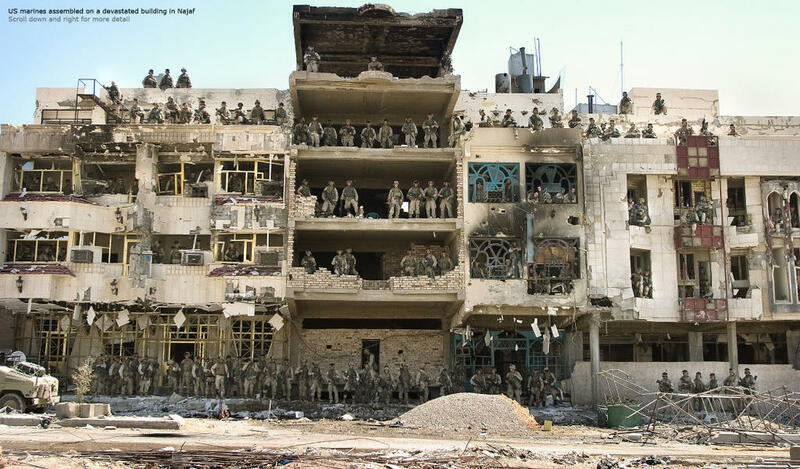 An image that shows hundreds of American soldiers posing in the bombed out shell of a holy Muslim city might speak to some of colonial occupation, but Lucian Read, the photographer, sees the picture as one of pride and solidarity: "I'm incredibly fond of it. It shows their need to be recognised. It says: 'This is us; this is all of us; and we did this together'." The image is part of Lucian Read's exhibition, Devil Dogs: No Better Friend, No Worse Enemy, which is currently touring America.